Emboss Resist with Distress Oxide Inks + join our challenge! We have a very special and fun surprise today! Heather Telford and all of us at The Foiled Fox are hosting a card challenge for anybody and everybody to participate. We are really hoping you will join the fun! We are kicking off the celebration with a beautiful emboss resist card by Heather. Soak up all her inspiration and how-tos, then dream up your own creation. Be sure to share it by clicking on the blue frog button below and follow the directions. Submitting your own emboss resist masterpiece will automatically enter you for a chance to win! I am always happy to be a guest on The Foiled Fox blog. Today’s post has me even more excited than usual because we are hosting a challenge together…Simply Irresistible. To create my emboss resist card I began by embossing the ‘Felicity’ stamp from Penny Black on hot pressed watercolor paper with WOW metallic gold rich embossing powder. I used Mini ink blending tools and foam to blend three colors of distress oxide ink over the embossing. My blending was fairly random with cracked pistachio, broken china and wilted violet distress oxide inks. Once I had a smooth blend of color over the whole panel I used a clear Wink of Stella pen to both lighten and add sparkle to the flowers. Distress Oxide inks are a mix of pigment and dye ink so adding ‘water’ to them in the form of Wink of Stella liquid dilutes the color and leaves some shimmer at the same time. The effect is subtle but it does make the flowers a little bit different to the surrounding blended area. I also added some Wink of Stella splatter to the panel which creates little light sparkles here and there. I have found that adding liquid, letting it sit briefly then dabbing it up with a paper towel is the best way to get the ‘oxidized pale’ effect on the inked surface. 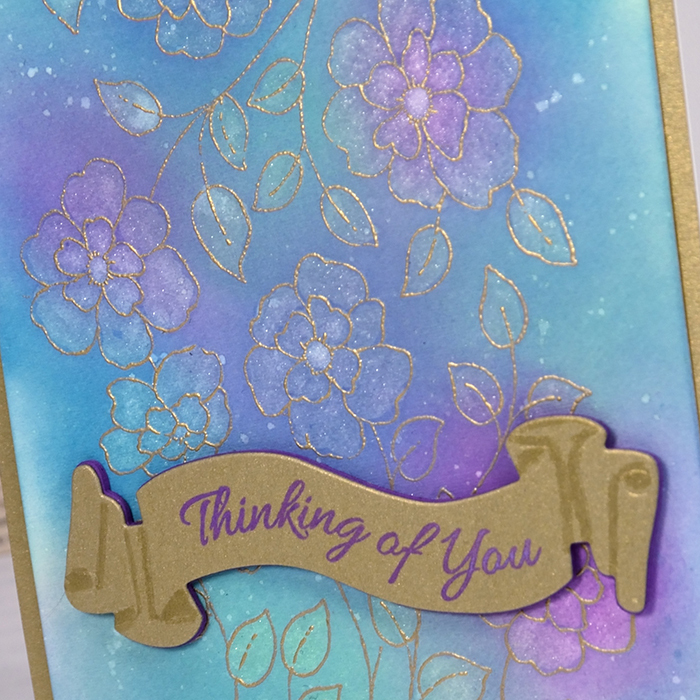 To finish this card I wanted to tie the sentiment and background in with the gold embossing. I mounted the ‘Felicity’ panel on a piece of gold cardstock and cut a banner from the same gold using one of Penny Black’s Birds & banners ‘ dies. I stamped on the banner with wilted violet distress oxide ink and a sentiment from the ‘Banner Sentiments’ set from Penny Black. The distress oxide inks emboss well but they also stamp beautifully on white or colored card stock. As the banner has folds suggested I used an ‘old paper’ distress marker to shade where the banner would be in shadow then popped it up on a piece of foam cut with the same banner die. Now it’s your turn. Create your own emboss resist card, then click on the blue frog button below to submit your entry!